Though my skin turns into nothing short of alligator hide during the winter season, I don't take as many steps necessary to keep it hydrated as I do during the spring/summer. Probably because my arms and legs are hidden under 15,000 layers in the colder months, which can make me lazy. But all bets are off in the warmer months since limbs are exposed every day and a sundress with scaly legs or ashy elbows is never a cute look. 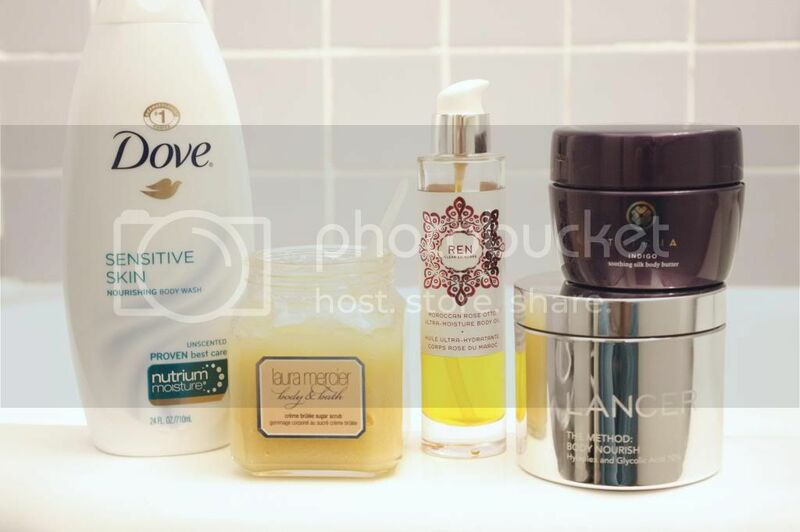 My summer skin prep has already begun and I have a few new products I am using this year mixed with a classic staple that never leaves my shower. 1. Dove Sensitive Skin Nourishing Body Wash - Probably one of the longest relationships I've ever had is with this body wash. I actually can't remember a time when I have not used it - it's that good. Many different body washes have tried to infiltrate my shower, but none have lasted. That's because this one is gentle yet effective, unscented and incredibly nourishing on the skin. Oddly enough, this was recommended to me by my gynecologist because it was safe enough to be used anywhere on the body (even on one's lady parts - yes, I said lady parts), and would not irritate. I am not consistent with most skincare and makeup that I use because I love to try new things, but this is one product that I will never stray from. We are in it for the long haul. 2. Laura Mercier Creme Brulee Sugar Scrub* - "It's a body scrub, and it exfoliates. The end." - is what I thought I would say after using this scrub. Boy was I in for a surprise. I actually said "Wow" after my first use, and consider it one of the best scrubs I have ever used. The texture is incredibly thick, almost like honey which makes it a bit more of a challenge to rub in, but as the product is massaged in, it warms up and begins to turn into a liquid. Sugar is more healing than salt so my skin always feels nourished and soothed after. Oh, and it smells like creme brulee. YUM, now I want a cupcake. 3. REN Moroccan Rose Otto Body Oil - If the immediate absorption doesn't lure you in, then the scent will. I find that when using this I rarely need perfume, and the delicate rose scent is pleasant without being overpowering. I use this in the morning because it dries quickly and allows me to get dressed almost immediately. No residue is left and my skin feels incredible. 4. Tatcha Indigo Soothing Silk Body Butter - While the REN body oil is perfect for day time, I tend to like something a bit more rich at night. I have seen this Tatcha body cream all over Instagram and I just had to try for myself. And now I know why everyone is loving it - it is pure decadence, yet extremely effective. Designed for all skin types, especially sensitive and those with eczema, rosacea or dermatitis, this helps to immediately soothe my skin, and any skin irritation is immediately calmed. This will definitely stay with me into the winter season. 5. Lancer The Method: Body Nourish* - I had a chance recently to attend a fall launch preview at Bergdorf Goodman and this one from Dr. Lancer was quite unique. It is a body cream containing glycolic acid which helps to exfoliate the skin. I use this once or twice a week in conjunction with my Laura Mercier body scrub and find that the combination of the two have helped keep my skin smoother than it has ever been. An added benefit that I found once I began using this body cream was how even toned my skin began to look especially on my arms, chest and back. While I have always loved using glycolic acid on my face, I never truly made the connection that I would have the same results if used on the rest of my body. Duh, clearly not my brightest moment. Keep your eyes peeled for fall when this launches - it is worth a try!